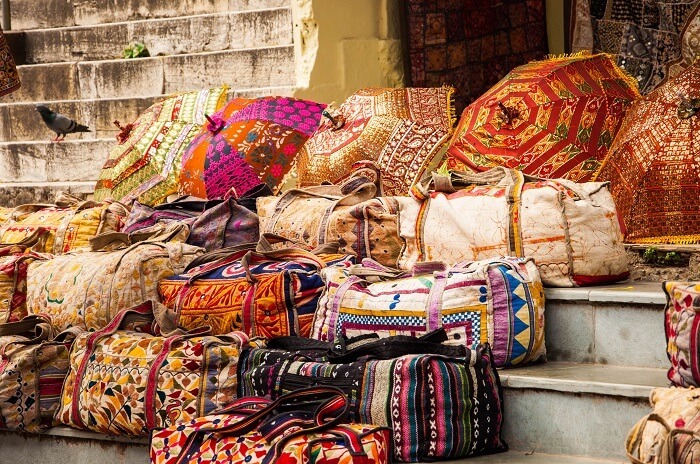 If you are a sucker for beautiful Rajasthani handicrafts and paintings, then this market is your spot. Filled with traditional Rajasthani folk art, it brings you back to the good old days. The market is reasonably priced and also offers Bandhani sarees and Jutis. It caters to almost all the needs of a visitor. Timings- 9:30 a.m. to 6:00 p.m.
Acting like a plethora of brightly coloured clothes and footwear. It is an ideal place for budget souvenir shopping. From big showrooms to small shops, this market is an essential. Bargaining is the mantra which works here. Named after Maharana Pratap’s faithful horse, this circle is one of the best shopping places and a bustling marketplace. From dancing puppets, wall decorations, pens, pen stands, traditional lanterns, handmade papers, and painted wooden boxes to exquisite pottery. Mandi Bazaar, at the back of Chetak Circle, is famous for freshly ground spices and herbs. With extravaganza of handcrafted products such as textile, furniture, blue pottery, terracotta pottery, paintings, silver and lac jeweller, Rajasthali is an initiative by the Rajasthan Government to promote their culture. It’s time to kick up your lehengas and jazz your look with that oxidised jewellery you have been dying to wear. An initiative to empower women, set up in 1988, Sadhna Emporium is one of the best destinations to find hand stitched textiles with embroidery work. Crafted with excellence the range of products includes bed sheets, cushion covers, table mats & coasters, table covers, bags, dairies, dupattas, kurtas, sarees, and jackets . Apart from a shopping heaven in Udaipur, the main attraction of this place is the way it is constructed. It gives you a glimpse into the lifestyle of the rural Rajasthanis. Built in the style of a village in 70 acres, the crafts village of Shilpgram is a beautiful place to visit and spend time at and to watch the various dance and music events which take place here on a regular basis.